This common pezizoid fungus appears on very rotten hardwood, often inside hollow dead stumps, particularly of Beech trees. Like so many of the commonly encountered cup fungi, identification is made more difficult by its range of colours, which vary with substrate and stage of development. Peziza micropus is fairly common and widespread in Britain and Ireland, and it occurs also in many other parts of Europe and in Asia. 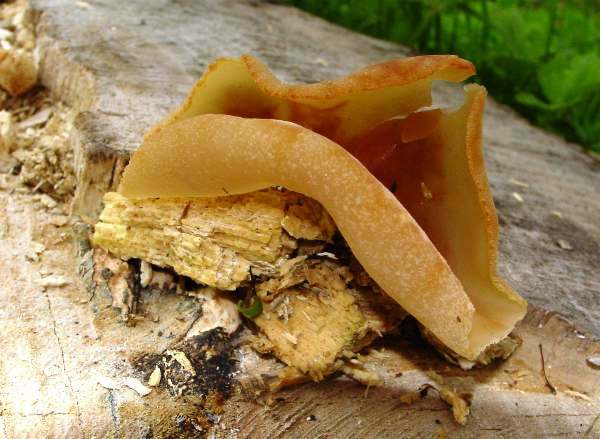 This wood-rotting cup fungus was described in 1800 by Christiaan Hendrik Persoon, who gave it the binomial scientific name Peziza micropus by which it is still generally known today. Synonyms of Peziza micropus include Aleuria micropus (Pers.) Gillet, Geopyxis cocotina (Cooke) Massee, Lachnea cocotina (Cooke) W. Phillips, Otidea micropus (Pers.) Sacc., Aleuria cerea var. cocotina (Cooke) Boud., and Sarcoscypha cocotina (Cooke) Sacc. 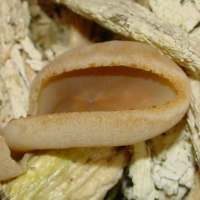 Peziza, the genus name, may come from a Latin root referring to a foot - most fungi in this group being sessile (footless or stemless). 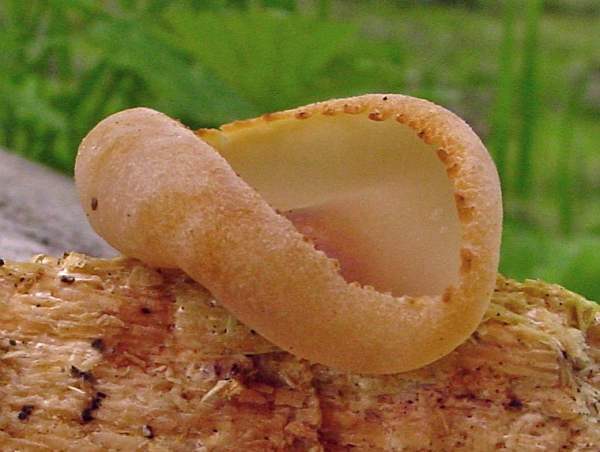 The specific epithet micropus means 'with a small leg' - a reference to the very short stem of this cup fungus. A shallow cup 1 to 5cm across; inner surface smooth, ochre; outer surface slightly paler and finely granular or floury; margin inrolled; its short, narrow stem is usually buried in the substrate timber and not visible without excavating some of the surrounding substrate. Ellipsoidal, smooth, 15-17 x 8.5-9.5µm. Not distinctive. Like nearly all of the cup fungi, this species in inedible. On rotten hardwoods, notably Beech and elms. There are at least 100 Peziza species and most are various shades of fawn or brown. Definite identification is rarely possible without microscopic examination. Dennis, R.W.G. (1981). British Ascomycetes; Lubrecht & Cramer; ISBN: 3768205525. Breitenbach, J. & Kränzlin, F. (1984). Fungi of Switzerland. Volume 1: Ascomycetes. Verlag Mykologia: Luzern, Switzerland. Medardi, G. (2006). Ascomiceti d'Italia. Centro Studi Micologici: Trento.